Over the past few years we’ve noticed a few stories appearing on the internet relating to the introduction of a fashion modification which firstly blows my mind (pun intended), and secondly reinforces the hunch that some inventors have exhausted their supply of fresh ideas. The trend I’m referring to is Air Conditioned Clothing and on a whim I decided to find out whether someone could, if patient and sweaty enough, put together an entire air conditioned outfit based on products readily available via the internet. Below are the results, starting at the head. 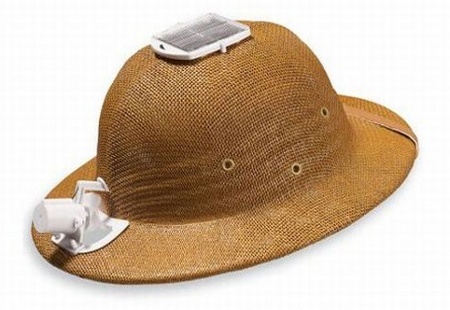 The Solar-Powered Cooling Pith Helmet is an unsightly stroke of genius which promises to provide an energy efficient supply of cool air to the front of the head by way of a small fan. On top of the hat are small (but large enough to be seen from afar) solar panels which power said fan, however should the sun not be in view the power supply can be switched to a couple of headbound batteries. In all honesty, this is a good idea. Aesthetically though, not so much. Of all the air conditioned items of clothing on the list, this one is a definite favourite. Inside the knot of the tie produced by Thanko sits a small fan unit, ready to pump cool air towards the collar area by way of power sourced via the USB port of your computer. No batteries needed. If that’s not enough to sell the idea, just take a look at the chap’s face in the top right hand corner of the picture. Cool air plus a vibrating laryngeal prominence makes Jack a happy boy. A Japanese company by the name of Kuchou-fuku (trans: air conditioned clothes) have the torso covered with this air conditioned shirt; a garment which manages to give the human wearing it the appearance of a skydiver mid-drop thanks to its interior cooling system. 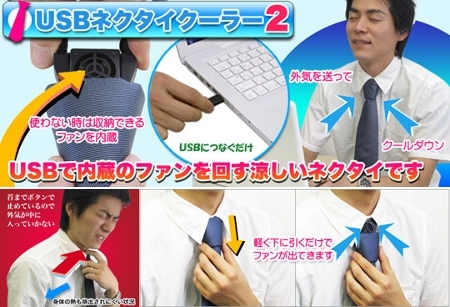 Two fans blow air around the shirt via a rechargeable battery pack. For the lower body, these cargo pants will have to do. From the photo above it looks as though they’ve replaced the lower pockets with fans, resulting in an ideal pair of trousers for those who work in sweaty environments. I’ve no idea who’s responsible for these but they look similar enough in style to Kuchou-fuku’s shirt for me to point my finger at the same company. Again, they look horrific so to wear them unless absolutely essential would be dangerous. Ever wished your shoes contained an air conditioning system? I know I have so I’m happy as Larry now that I’ve discovered the Breezewalk shoe: a piece of footwear which supposedly keeps the foot cool and fresh by way of an air pump in the heel. 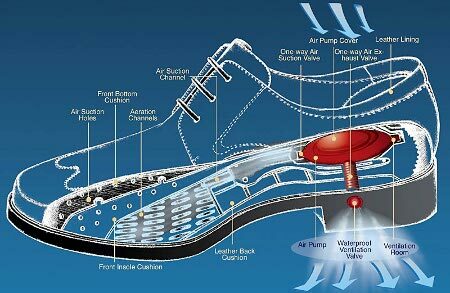 As you walk, the pump pushes air around the shoe. Not exactly hi-tech and possibly more gimmick than anything else, but 10 out of 10 for effort. What I’d prefer is the ability to pump hot air around my toes when it’s cold. When that’s available, give me a call.